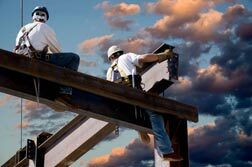 For small to large projects, we offer fully-written Health and Safety/ Accident Prevention Plans that meet all USACE EM 385-1-1 Appendix "A" requirements. For small projects, all you'll need is the site/project-specific EM 385 Accident Prevention Plan. For larger projects (over $5 million), you'll need a coordinated safety manual to go along with your Accident Prevention Plan to establish an organized structure for managing your safety. We offer two levels of plans based on your project and contract requirements. Guaranteed compliance with USACE EM 385-1-1 Appendix "A"
Complete set of Risk Management Plan Templates for Fall Protection, Critical Lift, etc. Your Accident Prevention/ Health & Safety Plan will follow EM 385 Appendix "A" format exactly. And, provides the details that your Contracting Officer expects in a well-formed safety plan. Download an APP/Safety Plan sample and find out what you'll get in each section of your template. Don't want to download a sample? Contact us at 410-451-8006 and we'll answer all of your questions.